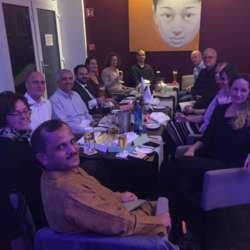 You must be a member of the Hannover Professionals Networking Group to attend this activity. Would you like to join this group? Dear members of the business networking group! Welcome to the fourth session for our event series Fenna developed for international communities: Russia. The series is called "intercultural differences in practice". We will go through a lots of countries. After a speech we will exchange experiences. Also we have time for regular business networking. We managed to sign up Maria Krylova, a well known host in our Hannover community to introduce the Russian culture to share some valuable insight on Russia with a focus on the capital, Moscow. Of course, as always we count on all of you to enrich the discussion with your own experiences and questions. 18:00 Welcome, maybe order snack / dinner. 18: Protected content Speech and Discussion. We choose a more practical and "lively" approach - namely exchanging real experiences, situations and feelings and not only philosophizing theories (e.g. the dimensions of Hofstede) or just listening to a speech where others "explain the world" to us. - What are your most impressive and/or weird experiences - at the workplace and/or the general lifestyle? - What are significant intercultural differences between your culture(s) and the chosen country/culture? How do you and others deal with it? - How do other Internations members see these differences from their own experience? Do they share your opinion? What do you have in common with other cultures, looking to Germany? - Where do you see obstacles or opportunities to make business (e.g. as an entrepreneur or CEO, supervisor and/or employee) and/or to work in Germany, compared to other countries? - Are there any recommendations or special "insider-tips" for others? - How can we help each other to get along in the business world? - Which special questions do you have to the Internations members which you do not find in books and what you always wanted to know, never dared to ask or never got an answer? We plan to build up a series "going" through the whole world, also e.g. Asian culture, Arab culture, African Culture, Eastern and Southern Europe, U.S, UK, India, Latin America and so on. The events are always moderated by the consuls and/or another member. After the event, we also have time to come down to regular business networking. Please feel free to contact one of us if there is a topic you would like to cover. Also if you are interested to give a short speech about your country or your experiences, please contact us!